No matter how many times I visit, Colonial Williamsburg remains a favorite place for me for weekend getaways. I am amazed at how the 18th century capital came to life in these modern times. In there, you can extract yourself from our current century and live, walk, eat and interact just like in colonial times. It's late spring but humidity was surprisingly oppressive and stifling when we were there, but the weather didn't put a damper on our plans on experiencing Williamsburg. 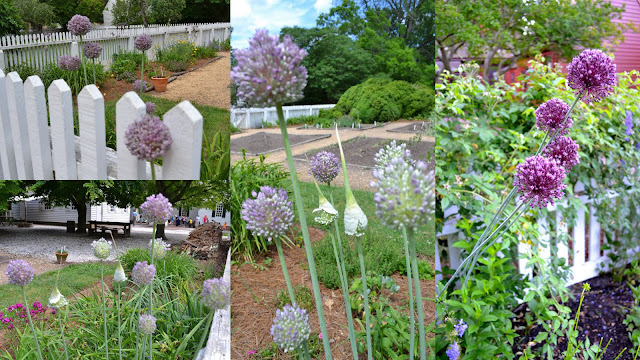 The gardens at Williamsburg are in bloom. Flowers are abundant and so are vegetables and spices. Well maintained gardens and homes. I took this photo because I love how the tree seems to frame that little house. I think this is the guardhouse. My favorite subject to photograph - purple round flowers. The Governor's Palace. This might look simple in the outside, but take a tour inside and you'll be amazed. One of the actors getting ready for the night walks. The roof of the Governor's Palace. Closer shot of the Palace. This is our tour guide inside the Capital Building. Interior of the Capital Building. Capital Building's interior - This is where crimes are tried. Our tour guide for our visit inside the Prison. it's a charming little destination. is this like park where you enter it and all these structures are there and when you go out "real life" happends with all the fastfood and shopping and hotels? What a beautiful place. I think I would absolutely love it. Need to make sure we visit Williamsburg when we are next in the US. indeed a beautiful place to visit. kahit ako hindi magsasawang bumalik balik jan. the place is so refreshing. i love the place. yan ang tipo long lugar. and when i have a house, i want those wooden fences too! would be nice to live here, even in the smallest house, it's like living in a beautiful park! and in another timeline.. hmmm..
@ Photo Cache, the town of Williamsburg is a park itself and there are no fast food within that area. @ Grace, Yes, it is a living park. Real people live there. I think they're lucky because the area is beautiful. Kayni and KG, I have always loved white wooden fences. I might have my house decorated and surrounded by that, hehe. I love how the plants grow so neat..and how the place is maintained..
You must be in your vacation now. Hope you're having a great one! Hi! I am Earvs and I'm currently doing my MA Thesis at UP Open University. My thesis will talk about OFW Bloggers. I've checked PEBA and you're one of the winners last year. I hope you can be one of my respondents. Should you be available and interested in this benchmark research, please email me at ecabalquinto@gmail.com. Salamat! Keep blogging. Nakakatuwa entries mo!